Yesterday we kicked off the UN climate conference by bringing the Cancun climate to Ottawa. 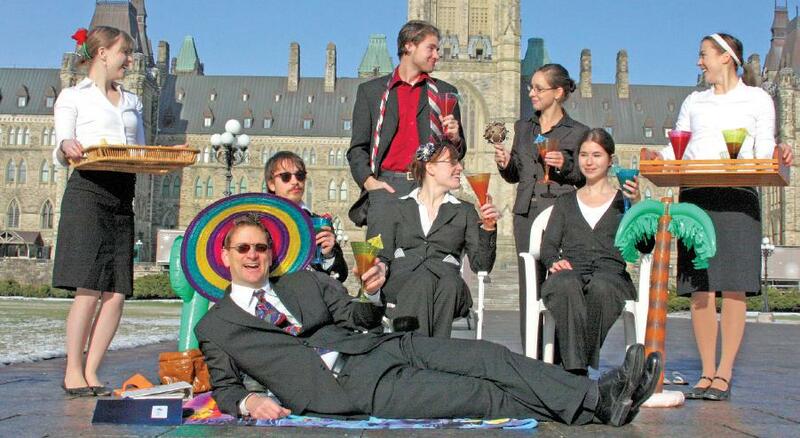 Okay, not the warmth or the real beach, but there was a beach scene set up on Parliament Hill featuring a new drink – Tropical Tailings – beach chairs, flip flops and Mexican party music. A representative of the “Canadian Alliance of Petroleum Peddlers” provided a pre-departure briefing for the Canadian delegation headed to Cancun. His main message? Sit back, enjoy the beach, do nothing that would hamper tar sands growth. The event was part of the Gracias Por Nada work that CYCC and Environmental Defence have teamed up on. We’re running a full-page ad in the Cancun newspaper, handing out t-shirts to delegates and reaching out online to make sure people know that tar sands is holding Canada, and other countries, back from getting serious about global warming. Check out the actual campaign! Check out the Sierra Youth Coalition’s Write-up about this action, as well as it’s awesome shout out to CYD’ers! Here is the press release that went out yesterday as well! 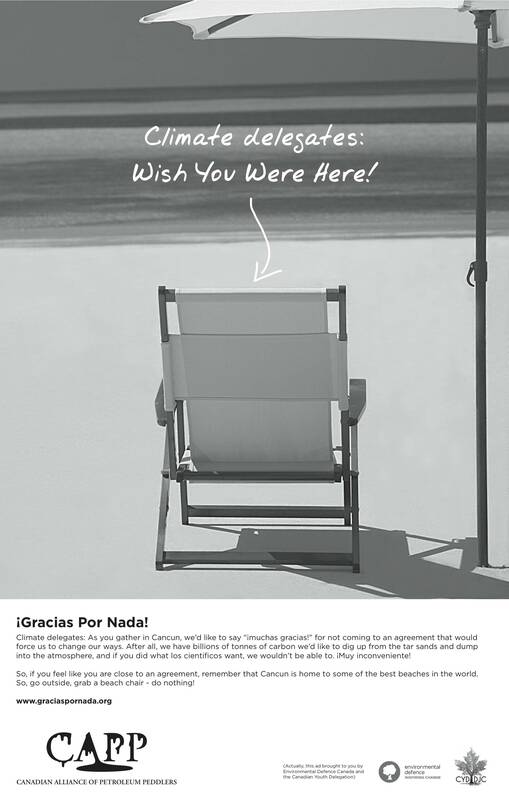 Ottawa and Cancun – Today, on the opening day of the U.N. climate conference in Cancun, Environmental Defence and the Canadian Youth Climate Coalition launched “Gracias Por Nada,” a campaign by the mock Canadian Alliance of Petroleum Peddlers to thank delegates for doing nothing to tackle global warming. Extracting and burning all of the estimated 315 billion barrels of potentially recoverable tar sands oil would put roughly 183 billion tonnes of carbon dioxide into the atmosphere, enough to raise the concentration of CO2 in the atmosphere by 9-12 parts per million if burned all at once. This is more than 26 years of total U.S. emissions. If tar sands production expands at the rate predicted by the Canadian Association of Petroleum Producers, tar sands oil will produce about 2.2 million tonnes of carbon dioxide each day, and over 800 million tonnes each year by 2025. The tar sands industry would be responsible for more emissions than entire countries like Canada, the U.K., Australia and France currently produce.